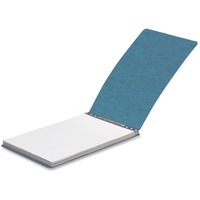 Top binding report cover is made of 20 point genuine Presstex with a moisture resistant surface for longer life. Report covers stack easily and lie extra flat. Fasteners quickly adjust to hold the designated capacity. Design also includes a spine reinforced with tear resistant, color matched Tyvek tape. Report cover contains a high percentage of recycled material.